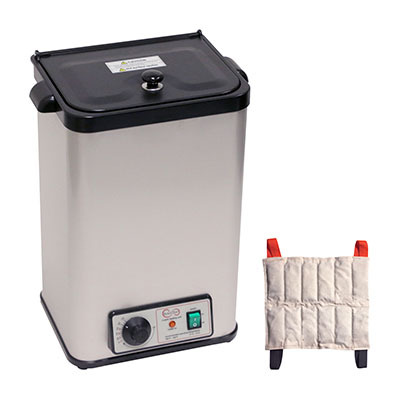 Relief Pak® Heating Units effectively heat moist heat packs up to 170° in an insulated hot water bath. The Relief Pak® Heating Unit 4-Pack Capacity effectively heats moist heat packs up to 170° in an insulated hot water bath. Insulated design keeps heat from dispersing out of the unit, allowing it to retain heat. It is made from durable stainless steel that's perfect for high traffic clinics and its compact stationary design allows it to easily sit on a countertop. This heating unit features adjustable temperature control and a glowing orange light illuminates when the unit has reached its desired temperature. It is best to use moist heat packs at 160° for best results. An on/off switch glows green when the unit is in use. 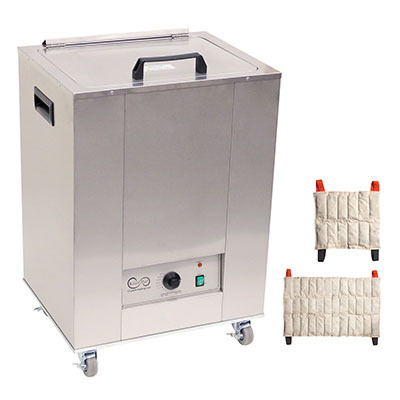 This unit has a 4-pack capacity that can heat up to 4 standard moist heat packs. A removable plug set comes with this 110V unit. A set of 4 standard Relief Pak® HotSpot® Moist Heat Packs come with this unit. These heat packs are reusable and can maintain therapeutic heat for up to 30 minutes. Dimensions: 13.98" x 19.69" x 10.63"
The Relief Pak® Heating Unit 4-Pack Capacity effectively heats moist heat packs up to 170° in an insulated hot water bath. Insulated design keeps heat from dispersing out of the unit, allowing it to retain heat. It is made from durable stainless steel that's perfect for high traffic clinics and its compact stationary design allows it to easily sit on a countertop. This heating unit features adjustable temperature control and a glowing orange light illuminates when the unit has reached its desired temperature. It is best to use moist heat packs at 160° for best results. An on/off switch glows green when the unit is in use. 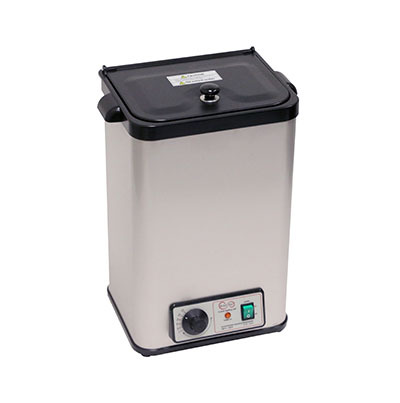 This unit has a 4-pack capacity that can heat up to 4 standard moist heat packs. A removable plug set comes with this 110V unit. A set of 3 standard Relief Pak® HotSpot® Moist Heat Packs and a neck pack come with this unit. These heat packs are reusable and can maintain therapeutic heat for up to 30 minutes. The Relief Pak® Heating Unit 4-Pack Capacity effectively heats moist heat packs up to 170° in an insulated hot water bath. Insulated design keeps heat from dispersing out of the unit, allowing it to retain heat. It is made from durable stainless steel that's perfect for high traffic clinics and its compact stationary design allows it to easily sit on a countertop. This heating unit features adjustable temperature control and a glowing orange light illuminates when the unit has reached its desired temperature. It is best to use moist heat packs at 160° for best results. An on/off switch glows green when the unit is in use. 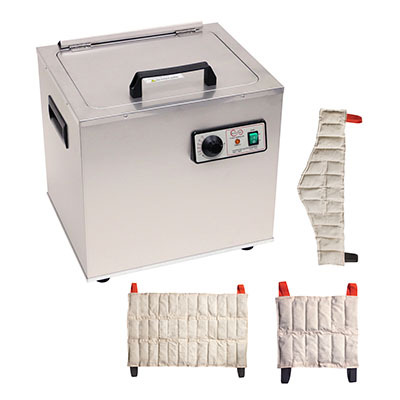 This unit has a 4-pack capacity that can heat up to 4 standard moist heat packs. A removable plug set comes with this 110V unit. A set of 2 standard Relief Pak® HotSpot® Moist Heat Packs and 2 neck packs come with this unit. These heat packs are reusable and can maintain therapeutic heat for up to 30 minutes. The Relief Pak® Heating Unit 6-Pack Capacity effectively heats moist heat packs up to 170° in an insulated hot water bath. Insulated design keeps heat from dispersing out of the unit, allowing it to retain heat. It is made from durable stainless steel that's perfect for high traffic clinics and its compact stationary design allows it to easily sit on a countertop. This heating unit features adjustable temperature control and a glowing orange light illuminates when the unit has reached its desired temperature. It is best to use moist heat packs at 160° for best results. An on/off switch glows green when the unit is in use. This unit has a 6-pack capacity that can heat up to 6 moist heat packs. A removable plug set comes with this 110V unit. A set of 3 standard, 2 oversized, and 1 neck sized Relief Pak® HotSpot® Moist Heat Packs come with this unit. These heat packs are reusable and can maintain therapeutic heat for up to 30 minutes. Dimensions: 19.02" x 21.65" x 17.32"
The Relief Pak® Heating Unit 6-Pack Capacity effectively heats moist heat packs up to 170° in an insulated hot water bath. Insulated design keeps heat from dispersing out of the unit, allowing it to retain heat. It is made from durable stainless steel that's perfect for high traffic clinics and its compact stationary design allows it to easily sit on a countertop. This heating unit features adjustable temperature control and a glowing orange light illuminates when the unit has reached its desired temperature. It is best to use moist heat packs at 160° for best results. An on/off switch glows green when the unit is in use. 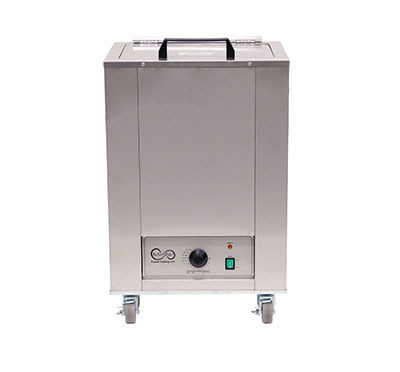 This unit has a 6-pack capacity that can heat up to 6 moist heat packs. A removable plug set comes with this 110V unit. A set of 6 standard sized Relief Pak® HotSpot® Moist Heat Packs come with this unit. These heat packs are reusable and can maintain therapeutic heat for up to 30 minutes. The Relief Pak® Heating Unit 8-Pack Capacity effectively heats moist heat packs up to 170° in an insulated hot water bath. Insulated design keeps heat from dispersing out of the unit, allowing it to retain heat. It is made from durable stainless steel that's perfect for high traffic clinics and its mobile design with rolling feet allow it to be easily moved across a room. This heating unit features adjustable temperature control and a glowing orange light illuminates when the unit has reached its desired temperature. It is best to use moist heat packs at 160° for best results. An on/off switch glows green when the unit is in use. This unit has a 8-pack capacity that can heat up to 8 moist heat packs. A removable plug set comes with this 110V unit. A set of 8 standard Relief Pak® HotSpot® Moist Heat Packs come with this unit. These heat packs are reusable and can maintain therapeutic heat for up to 30 minutes. Dimensions: 19.02" x 29.53" x 17.32"
The Relief Pak® Heating Unit 8-Pack Capacity effectively heats moist heat packs up to 170° in an insulated hot water bath. Insulated design keeps heat from dispersing out of the unit, allowing it to retain heat. It is made from durable stainless steel that's perfect for high traffic clinics and its mobile design with rolling feet allow it to be easily moved across a room. This heating unit features adjustable temperature control and a glowing orange light illuminates when the unit has reached its desired temperature. It is best to use moist heat packs at 160° for best results. An on/off switch glows green when the unit is in use. This unit has a 8-pack capacity that can heat up to 8 moist heat packs. A removable plug set comes with this 110V unit. A set of 4 standard Relief Pak® HotSpot® Moist Heat Packs and 4 neck packs come with this unit. These heat packs are reusable and can maintain therapeutic heat for up to 30 minutes. 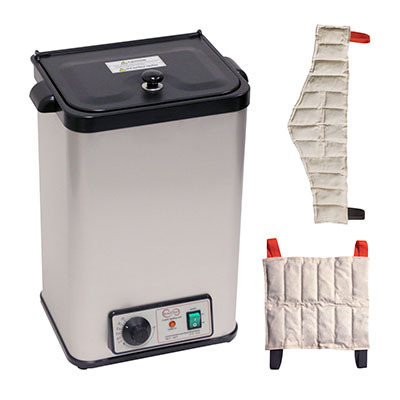 The Relief Pak® Heating Unit 8-Pack Capacity effectively heats moist heat packs up to 170° in an insulated hot water bath. Insulated design keeps heat from dispersing out of the unit, allowing it to retain heat. It is made from durable stainless steel that's perfect for high traffic clinics and its mobile design with rolling feet allow it to be easily moved across a room. This heating unit features adjustable temperature control and a glowing orange light illuminates when the unit has reached its desired temperature. It is best to use moist heat packs at 160° for best results. An on/off switch glows green when the unit is in use. This unit has a 8-pack capacity that can heat up to 8 moist heat packs. A removable plug set comes with this 110V unit. A set of 2 standard Relief Pak® HotSpot® Moist Heat Packs, 2 neck packs, and 2 oversized packs come with this unit. These heat packs are reusable and can maintain therapeutic heat for up to 30 minutes. The Relief Pak® Heating Unit 12-Pack Capacity effectively heats moist heat packs up to 170° in an insulated hot water bath. Insulated design keeps heat from dispersing out of the unit, allowing it to retain heat. It is made from durable stainless steel that's perfect for high traffic clinics and its mobile design with rolling feet allow it to be easily moved across a room. This heating unit features adjustable temperature control and a glowing orange light illuminates when the unit has reached its desired temperature. It is best to use moist heat packs at 160° for best results. An on/off switch glows green when the unit is in use. This unit has a 12-pack capacity that can heat up to 12 moist heat packs. A removable plug set comes with this 110V unit. A set of 12 standard Relief Pak® HotSpot® Moist Heat Packs come with this unit. These heat packs are reusable and can maintain therapeutic heat for up to 30 minutes. Dimensions: 22.64" x 33.86" x 19.69"
The Relief Pak® Heating Unit 12-Pack Capacity effectively heats moist heat packs up to 170° in an insulated hot water bath. Insulated design keeps heat from dispersing out of the unit, allowing it to retain heat. It is made from durable stainless steel that's perfect for high traffic clinics and its mobile design with rolling feet allow it to be easily moved across a room. This heating unit features adjustable temperature control and a glowing orange light illuminates when the unit has reached its desired temperature. It is best to use moist heat packs at 160° for best results. An on/off switch glows green when the unit is in use. This unit has a 12-pack capacity that can heat up to 12 moist heat packs. A removable plug set comes with this 110V unit. A set of 3 standard Relief Pak® HotSpot® Moist Heat Packs, 3 neck pads, and 3 oversized packs come with this unit. These heat packs are reusable and can maintain therapeutic heat for up to 30 minutes. The Relief Pak® Heating Unit 12-Pack Capacity effectively heats moist heat packs up to 170° in an insulated hot water bath. Insulated design keeps heat from dispersing out of the unit, allowing it to retain heat. It is made from durable stainless steel that's perfect for high traffic clinics and its mobile design with rolling feet allow it to be easily moved across a room. This heating unit features adjustable temperature control and a glowing orange light illuminates when the unit has reached its desired temperature. It is best to use moist heat packs at 160° for best results. An on/off switch glows green when the unit is in use. This unit has a 12-pack capacity that can heat up to 12 moist heat packs. A removable plug set comes with this 110V unit. A set of 4 standard Relief Pak® HotSpot® Moist Heat Packs, 4 neck packs, and 2 oversize packs come with this unit. These heat packs are reusable and can maintain therapeutic heat for up to 30 minutes. The Relief Pak® Heating Unit 12-Pack Capacity effectively heats moist heat packs up to 170° in an insulated hot water bath. Insulated design keeps heat from dispersing out of the unit, allowing it to retain heat. It is made from durable stainless steel that's perfect for high traffic clinics and its mobile design with rolling feet allow it to be easily moved across a room. This heating unit features adjustable temperature control and a glowing orange light illuminates when the unit has reached its desired temperature. It is best to use moist heat packs at 160° for best results. An on/off switch glows green when the unit is in use. This unit has a 12-pack capacity that can heat up to 12 moist heat packs. A removable plug set comes with this 110V unit. A set of 4 standard Relief Pak® HotSpot® Moist Heat Packs and 4 oversize packs come with this unit. These heat packs are reusable and can maintain therapeutic heat for up to 30 minutes. The Relief Pak® Heating Unit 24-Pack Capacity effectively heats moist heat packs up to 170° in an insulated hot water bath. Insulated design keeps heat from dispersing out of the unit, allowing it to retain heat. It is made from durable stainless steel that's perfect for high traffic clinics and its mobile design with rolling feet allow it to be easily moved across a room. This heating unit features adjustable temperature control and a glowing orange light illuminates when the unit has reached its desired temperature. It is best to use moist heat packs at 160° for best results. An on/off switch glows green when the unit is in use. 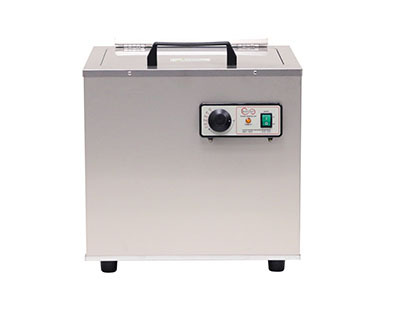 This unit has a 24-pack capacity that can heat up to 24 moist heat packs. A removable plug set comes with this 110V unit. A set of 24 standard Relief Pak® HotSpot® Moist Heat Packs come with this unit. These heat packs are reusable and can maintain therapeutic heat for up to 30 minutes. 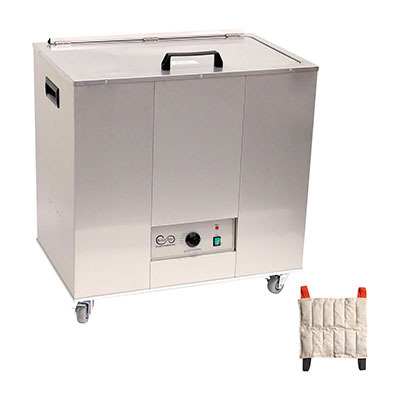 Dimensions: 32.09" x 34.65" x 21.65"
The Relief Pak® Heating Unit 24-Pack Capacity effectively heats moist heat packs up to 170° in an insulated hot water bath. Insulated design keeps heat from dispersing out of the unit, allowing it to retain heat. It is made from durable stainless steel that's perfect for high traffic clinics and its mobile design with rolling feet allow it to be easily moved across a room. This heating unit features adjustable temperature control and a glowing orange light illuminates when the unit has reached its desired temperature. It is best to use moist heat packs at 160° for best results. An on/off switch glows green when the unit is in use. 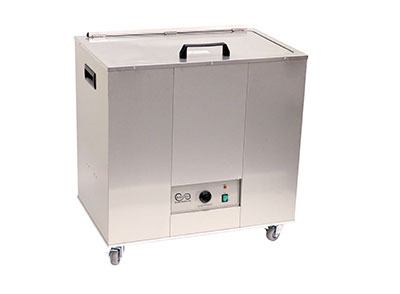 This unit has a 24-pack capacity that can heat up to 24 moist heat packs. A removable plug set comes with this 110V unit. A set of 8 oversize Relief Pak® HotSpot® Moist Heat Packs and 8 neck packs come with this unit. These heat packs are reusable and can maintain therapeutic heat for up to 30 minutes. The Relief Pak® Heating Unit 24-Pack Capacity effectively heats moist heat packs up to 170° in an insulated hot water bath. Insulated design keeps heat from dispersing out of the unit, allowing it to retain heat. It is made from durable stainless steel that's perfect for high traffic clinics and its mobile design with rolling feet allow it to be easily moved across a room. This heating unit features adjustable temperature control and a glowing orange light illuminates when the unit has reached its desired temperature. It is best to use moist heat packs at 160° for best results. An on/off switch glows green when the unit is in use. 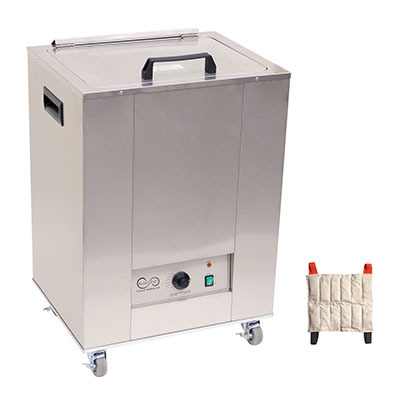 This unit has a 24-pack capacity that can heat up to 24 moist heat packs. A removable plug set comes with this 110V unit. A set of 6 standard Relief Pak® HotSpot® Moist Heat Packs, 6 neck packs and 6 oversize pack come with this unit. These heat packs are reusable and can maintain therapeutic heat for up to 30 minutes. 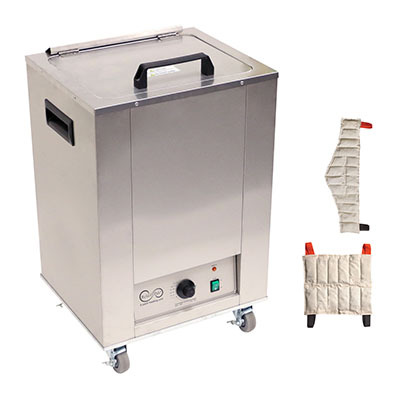 The Relief Pak® Heating Unit 4-Pack Capacity effectively heats moist heat packs up to 170° in an insulated hot water bath. Insulated design keeps heat from dispersing out of the unit, allowing it to retain heat. It is made from durable stainless steel that's perfect for high traffic clinics and its compact stationary design allows it to easily sit on a countertop. This heating unit features adjustable temperature control and a glowing orange light illuminates when the unit has reached its desired temperature. It is best to use moist heat packs at 160° for best results. An on/off switch glows green when the unit is in use. 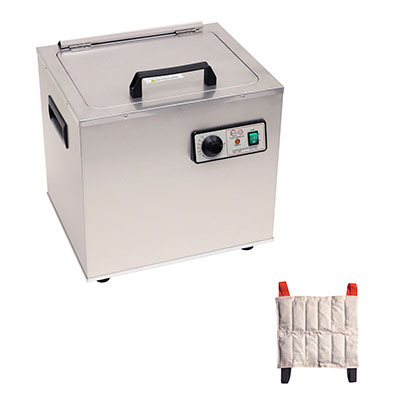 This unit has a 4-pack capacity that can heat up to 4 standard moist heat packs. A removable plug set comes with this 110V unit. The Relief Pak® Heating Unit 6-Pack Capacity effectively heats moist heat packs up to 170° in an insulated hot water bath. Insulated design keeps heat from dispersing out of the unit, allowing it to retain heat. It is made from durable stainless steel that's perfect for high traffic clinics and its compact stationary design allows it to easily sit on a countertop. This heating unit features adjustable temperature control and a glowing orange light illuminates when the unit has reached its desired temperature. It is best to use moist heat packs at 160° for best results. An on/off switch glows green when the unit is in use. 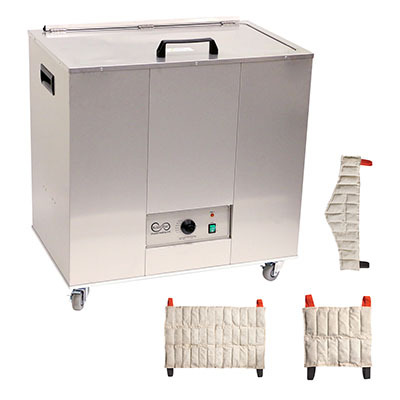 This unit has a 6-pack capacity that can heat up to 6 moist heat packs. A removable plug set comes with this 110V unit. The Relief Pak® Heating Unit 8-Pack Capacity effectively heats moist heat packs up to 170° in an insulated hot water bath. Insulated design keeps heat from dispersing out of the unit, allowing it to retain heat. It is made from durable stainless steel that's perfect for high traffic clinics and its mobile design with rolling feet allow it to be easily moved across a room. This heating unit features adjustable temperature control and a glowing orange light illuminates when the unit has reached its desired temperature. It is best to use moist heat packs at 160° for best results. An on/off switch glows green when the unit is in use. This unit has a 8-pack capacity that can heat up to 8 moist heat packs. A removable plug set comes with this 110V unit. The Relief Pak® Heating Unit 12-Pack Capacity effectively heats moist heat packs up to 170° in an insulated hot water bath. Insulated design keeps heat from dispersing out of the unit, allowing it to retain heat. It is made from durable stainless steel that's perfect for high traffic clinics and its mobile design with rolling feet allow it to be easily moved across a room. This heating unit features adjustable temperature control and a glowing orange light illuminates when the unit has reached its desired temperature. It is best to use moist heat packs at 160° for best results. An on/off switch glows green when the unit is in use. This unit has a 12-pack capacity that can heat up to 12 moist heat packs. A removable plug set comes with this 110V unit. The Relief Pak® Heating Unit 24-Pack Capacity effectively heats moist heat packs up to 170° in an insulated hot water bath. Insulated design keeps heat from dispersing out of the unit, allowing it to retain heat. It is made from durable stainless steel that's perfect for high traffic clinics and its mobile design with rolling feet allow it to be easily moved across a room. This heating unit features adjustable temperature control and a glowing orange light illuminates when the unit has reached its desired temperature. It is best to use moist heat packs at 160° for best results. An on/off switch glows green when the unit is in use. 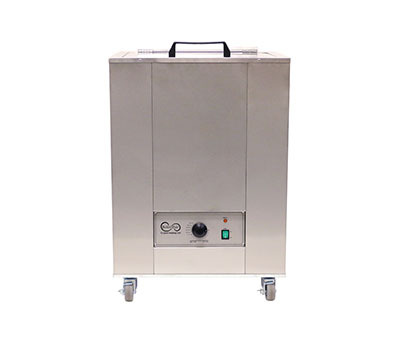 This unit has a 24-pack capacity that can heat up to 24 moist heat packs. A removable plug set comes with this 110V unit. The Relief Pak® Heating Unit 4-Pack Capacity effectively heats moist heat packs up to 77°C in an insulated hot water bath. Insulated design keeps heat from dispersing out of the unit, allowing it to retain heat. It is made from durable stainless steel that's perfect for high traffic clinics and its compact stationary design allows it to easily sit on a countertop. This heating unit features adjustable temperature control and a glowing orange light illuminates when the unit has reached its desired temperature. It is best to use moist heat packs at 71°C for best results. An on/off switch glows green when the unit is in use. This unit has a 4-pack capacity that can heat up to 4 standard moist heat packs. A removable plug set comes with this 220V unit. A set of 4 standard Relief Pak® Moist Heat Packs come with this unit. These heat packs are reusable and can maintain therapeutic heat for up to 30 minutes. The Relief Pak® Heating Unit 4-Pack Capacity effectively heats moist heat packs up to 77°C in an insulated hot water bath. Insulated design keeps heat from dispersing out of the unit, allowing it to retain heat. It is made from durable stainless steel that's perfect for high traffic clinics and its compact stationary design allows it to easily sit on a countertop. This heating unit features adjustable temperature control and a glowing orange light illuminates when the unit has reached its desired temperature. It is best to use moist heat packs at 71°C for best results. An on/off switch glows green when the unit is in use. 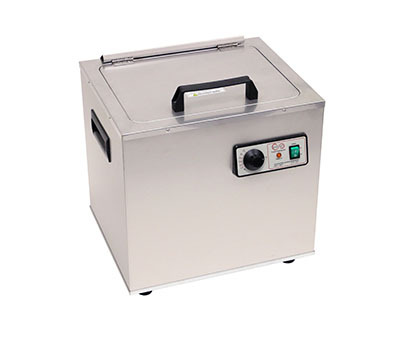 This unit has a 4-pack capacity that can heat up to 4 standard moist heat packs. A removable plug set comes with this 220V unit. A set of 3 standard Relief Pak® Moist Heat Packs and a neck pack come with this unit. These heat packs are reusable and can maintain therapeutic heat for up to 30 minutes. The Relief Pak® Heating Unit 4-Pack Capacity effectively heats moist heat packs up to 77°C in an insulated hot water bath. Insulated design keeps heat from dispersing out of the unit, allowing it to retain heat. It is made from durable stainless steel that's perfect for high traffic clinics and its compact stationary design allows it to easily sit on a countertop. This heating unit features adjustable temperature control and a glowing orange light illuminates when the unit has reached its desired temperature. It is best to use moist heat packs at 71°C for best results. An on/off switch glows green when the unit is in use. 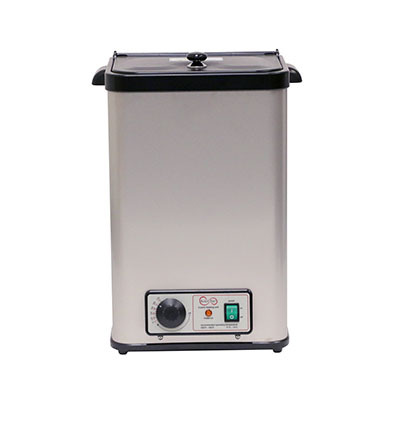 This unit has a 4-pack capacity that can heat up to 4 standard moist heat packs. A removable plug set comes with this 220V unit. A set of 2 standard Relief Pak® Moist Heat Packs and 2 neck packs come with this unit. These heat packs are reusable and can maintain therapeutic heat for up to 30 minutes. The Relief Pak® Heating Unit 6-Pack Capacity effectively heats moist heat packs up to 77°C in an insulated hot water bath. Insulated design keeps heat from dispersing out of the unit, allowing it to retain heat. It is made from durable stainless steel that's perfect for high traffic clinics and its compact stationary design allows it to easily sit on a countertop. This heating unit features adjustable temperature control and a glowing orange light illuminates when the unit has reached its desired temperature. It is best to use moist heat packs at 71°C for best results. An on/off switch glows green when the unit is in use. 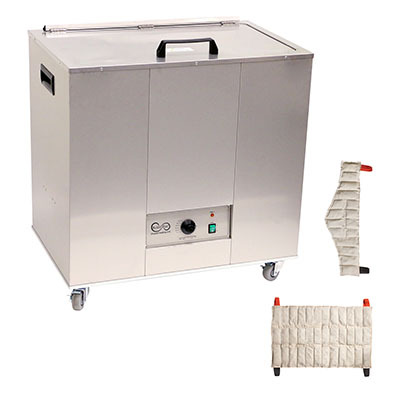 This unit has a 6-pack capacity that can heat up to 6 moist heat packs. A removable plug set comes with this 220V unit. A set of 3 standard, 2 oversized, and 1 neck sized Relief Pak® Moist Heat Packs come with this unit. These heat packs are reusable and can maintain therapeutic heat for up to 30 minutes. The Relief Pak® Heating Unit 6-Pack Capacity effectively heats moist heat packs up to 77°C in an insulated hot water bath. Insulated design keeps heat from dispersing out of the unit, allowing it to retain heat. It is made from durable stainless steel that's perfect for high traffic clinics and its compact stationary design allows it to easily sit on a countertop. This heating unit features adjustable temperature control and a glowing orange light illuminates when the unit has reached its desired temperature. It is best to use moist heat packs at 71°C for best results. An on/off switch glows green when the unit is in use. This unit has a 6-pack capacity that can heat up to 6 moist heat packs. A removable plug set comes with this 220V unit. A set of 6 standard sized Relief Pak® Moist Heat Packs come with this unit. These heat packs are reusable and can maintain therapeutic heat for up to 30 minutes. The Relief Pak® Heating Unit 8-Pack Capacity effectively heats moist heat packs up to 77°C in an insulated hot water bath. Insulated design keeps heat from dispersing out of the unit, allowing it to retain heat. It is made from durable stainless steel that's perfect for high traffic clinics and its mobile design with rolling feet allow it to be easily moved across a room. This heating unit features adjustable temperature control and a glowing orange light illuminates when the unit has reached its desired temperature. It is best to use moist heat packs at 71°C for best results. An on/off switch glows green when the unit is in use. This unit has a 8-pack capacity that can heat up to 8 moist heat packs. A removable plug set comes with this 220V unit. A set of 8 standard Relief Pak® Moist Heat Packs come with this unit. These heat packs are reusable and can maintain therapeutic heat for up to 30 minutes. The Relief Pak® Heating Unit 8-Pack Capacity effectively heats moist heat packs up to 77°C in an insulated hot water bath. Insulated design keeps heat from dispersing out of the unit, allowing it to retain heat. It is made from durable stainless steel that's perfect for high traffic clinics and its mobile design with rolling feet allow it to be easily moved across a room. This heating unit features adjustable temperature control and a glowing orange light illuminates when the unit has reached its desired temperature. It is best to use moist heat packs at 71°C for best results. An on/off switch glows green when the unit is in use. This unit has a 8-pack capacity that can heat up to 8 moist heat packs. A removable plug set comes with this 220V unit. A set of 4 standard Relief Pak® Moist Heat Packs and 4 neck packs come with this unit. These heat packs are reusable and can maintain therapeutic heat for up to 30 minutes. The Relief Pak® Heating Unit 8-Pack Capacity effectively heats moist heat packs up to 77°C in an insulated hot water bath. Insulated design keeps heat from dispersing out of the unit, allowing it to retain heat. It is made from durable stainless steel that's perfect for high traffic clinics and its mobile design with rolling feet allow it to be easily moved across a room. This heating unit features adjustable temperature control and a glowing orange light illuminates when the unit has reached its desired temperature. It is best to use moist heat packs at 71°C for best results. An on/off switch glows green when the unit is in use. This unit has a 8-pack capacity that can heat up to 8 moist heat packs. A removable plug set comes with this 220V unit. A set of 2 standard Relief Pak® Moist Heat Packs, 2 neck packs, and 2 oversized packs come with this unit. These heat packs are reusable and can maintain therapeutic heat for up to 30 minutes. The Relief Pak® Heating Unit 12-Pack Capacity effectively heats moist heat packs up to 77°C in an insulated hot water bath. Insulated design keeps heat from dispersing out of the unit, allowing it to retain heat. It is made from durable stainless steel that's perfect for high traffic clinics and its mobile design with rolling feet allow it to be easily moved across a room. This heating unit features adjustable temperature control and a glowing orange light illuminates when the unit has reached its desired temperature. It is best to use moist heat packs at 71°C for best results. An on/off switch glows green when the unit is in use. This unit has a 12-pack capacity that can heat up to 12 moist heat packs. A removable plug set comes with this 220V unit. A set of 12 standard Relief Pak® Moist Heat Packs come with this unit. These heat packs are reusable and can maintain therapeutic heat for up to 30 minutes. The Relief Pak® Heating Unit 12-Pack Capacity effectively heats moist heat packs up to 77°C in an insulated hot water bath. Insulated design keeps heat from dispersing out of the unit, allowing it to retain heat. It is made from durable stainless steel that's perfect for high traffic clinics and its mobile design with rolling feet allow it to be easily moved across a room. This heating unit features adjustable temperature control and a glowing orange light illuminates when the unit has reached its desired temperature. It is best to use moist heat packs at 71°C for best results. An on/off switch glows green when the unit is in use. This unit has a 12-pack capacity that can heat up to 12 moist heat packs. A removable plug set comes with this 220V unit. A set of 3 standard Relief Pak® Moist Heat Packs, 3 neck pads, and 3 oversized packs come with this unit. These heat packs are reusable and can maintain therapeutic heat for up to 30 minutes. The Relief Pak® Heating Unit 12-Pack Capacity effectively heats moist heat packs up to 77°C in an insulated hot water bath. Insulated design keeps heat from dispersing out of the unit, allowing it to retain heat. It is made from durable stainless steel that's perfect for high traffic clinics and its mobile design with rolling feet allow it to be easily moved across a room. This heating unit features adjustable temperature control and a glowing orange light illuminates when the unit has reached its desired temperature. It is best to use moist heat packs at 71°C for best results. An on/off switch glows green when the unit is in use. This unit has a 12-pack capacity that can heat up to 12 moist heat packs. A removable plug set comes with this 220V unit. A set of 4 standard Relief Pak® Moist Heat Packs, 4 neck packs, and 2 oversize packs come with this unit. These heat packs are reusable and can maintain therapeutic heat for up to 30 minutes. The Relief Pak® Heating Unit 12-Pack Capacity effectively heats moist heat packs up to 77°C in an insulated hot water bath. Insulated design keeps heat from dispersing out of the unit, allowing it to retain heat. It is made from durable stainless steel that's perfect for high traffic clinics and its mobile design with rolling feet allow it to be easily moved across a room. This heating unit features adjustable temperature control and a glowing orange light illuminates when the unit has reached its desired temperature. It is best to use moist heat packs at 71°C for best results. An on/off switch glows green when the unit is in use. This unit has a 12-pack capacity that can heat up to 12 moist heat packs. A removable plug set comes with this 220V unit. A set of 4 standard Relief Pak® Moist Heat Packs and 4 oversize packs come with this unit. These heat packs are reusable and can maintain therapeutic heat for up to 30 minutes. The Relief Pak® Heating Unit 24-Pack Capacity effectively heats moist heat packs up to 77°C in an insulated hot water bath. Insulated design keeps heat from dispersing out of the unit, allowing it to retain heat. It is made from durable stainless steel that's perfect for high traffic clinics and its mobile design with rolling feet allow it to be easily moved across a room. This heating unit features adjustable temperature control and a glowing orange light illuminates when the unit has reached its desired temperature. It is best to use moist heat packs at 71°C for best results. An on/off switch glows green when the unit is in use. 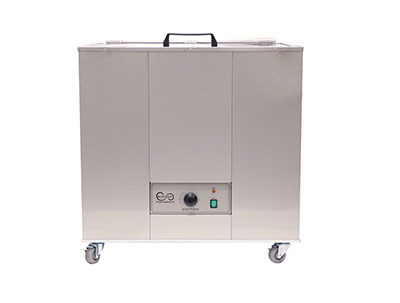 This unit has a 24-pack capacity that can heat up to 24 moist heat packs. A removable plug set comes with this 220V unit. A set of 24 standard Relief Pak® Moist Heat Packs come with this unit. These heat packs are reusable and can maintain therapeutic heat for up to 30 minutes. The Relief Pak® Heating Unit 24-Pack Capacity effectively heats moist heat packs up to 77°C in an insulated hot water bath. Insulated design keeps heat from dispersing out of the unit, allowing it to retain heat. It is made from durable stainless steel that's perfect for high traffic clinics and its mobile design with rolling feet allow it to be easily moved across a room. This heating unit features adjustable temperature control and a glowing orange light illuminates when the unit has reached its desired temperature. It is best to use moist heat packs at 71°C for best results. An on/off switch glows green when the unit is in use. 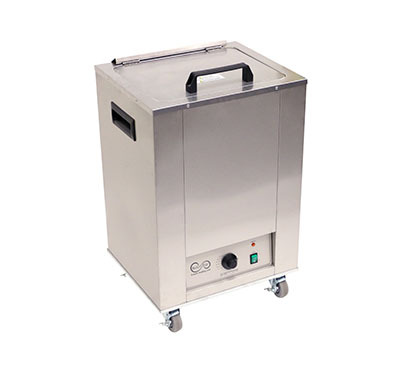 This unit has a 24-pack capacity that can heat up to 24 moist heat packs. A removable plug set comes with this 220V unit. A set of 8 oversize Relief Pak® Moist Heat Packs and 8 neck packs come with this unit. These heat packs are reusable and can maintain therapeutic heat for up to 30 minutes. The Relief Pak® Heating Unit 24-Pack Capacity effectively heats moist heat packs up to 77°C in an insulated hot water bath. Insulated design keeps heat from dispersing out of the unit, allowing it to retain heat. It is made from durable stainless steel that's perfect for high traffic clinics and its mobile design with rolling feet allow it to be easily moved across a room. This heating unit features adjustable temperature control and a glowing orange light illuminates when the unit has reached its desired temperature. It is best to use moist heat packs at 71°C for best results. An on/off switch glows green when the unit is in use. 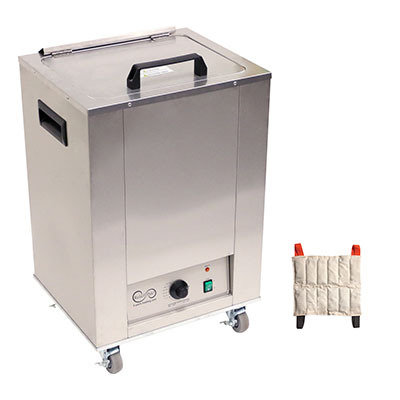 This unit has a 24-pack capacity that can heat up to 24 moist heat packs. A removable plug set comes with this 220V unit. A set of 6 standard Relief Pak® Moist Heat Packs, 6 neck packs and 6 oversize pack come with this unit. These heat packs are reusable and can maintain therapeutic heat for up to 30 minutes. The Relief Pak® Heating Unit 4-Pack Capacity effectively heats moist heat packs up to 77°C in an insulated hot water bath. Insulated design keeps heat from dispersing out of the unit, allowing it to retain heat. It is made from durable stainless steel that's perfect for high traffic clinics and its compact stationary design allows it to easily sit on a countertop. This heating unit features adjustable temperature control and a glowing orange light illuminates when the unit has reached its desired temperature. It is best to use moist heat packs at 71°C for best results. An on/off switch glows green when the unit is in use. 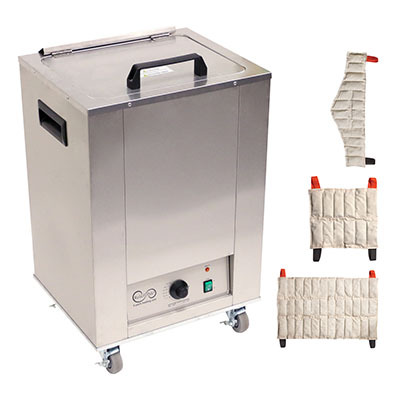 This unit has a 4-pack capacity that can heat up to 4 standard moist heat packs. A removable plug set comes with this 220V unit. The Relief Pak® Heating Unit 6-Pack Capacity effectively heats moist heat packs up to 77°C in an insulated hot water bath. Insulated design keeps heat from dispersing out of the unit, allowing it to retain heat. It is made from durable stainless steel that's perfect for high traffic clinics and its compact stationary design allows it to easily sit on a countertop. This heating unit features adjustable temperature control and a glowing orange light illuminates when the unit has reached its desired temperature. It is best to use moist heat packs at 71°C for best results. An on/off switch glows green when the unit is in use. This unit has a 6-pack capacity that can heat up to 6 moist heat packs. A removable plug set comes with this 220V unit. The Relief Pak® Heating Unit 8-Pack Capacity effectively heats moist heat packs up to 77°C in an insulated hot water bath. Insulated design keeps heat from dispersing out of the unit, allowing it to retain heat. It is made from durable stainless steel that's perfect for high traffic clinics and its mobile design with rolling feet allow it to be easily moved across a room. This heating unit features adjustable temperature control and a glowing orange light illuminates when the unit has reached its desired temperature. It is best to use moist heat packs at 71°C for best results. An on/off switch glows green when the unit is in use. This unit has a 8-pack capacity that can heat up to 8 moist heat packs. A removable plug set comes with this 220V unit. The Relief Pak® Heating Unit 12-Pack Capacity effectively heats moist heat packs up to 77°C in an insulated hot water bath. Insulated design keeps heat from dispersing out of the unit, allowing it to retain heat. It is made from durable stainless steel that's perfect for high traffic clinics and its mobile design with rolling feet allow it to be easily moved across a room. This heating unit features adjustable temperature control and a glowing orange light illuminates when the unit has reached its desired temperature. It is best to use moist heat packs at 71°C for best results. An on/off switch glows green when the unit is in use. This unit has a 12-pack capacity that can heat up to 12 moist heat packs. A removable plug set comes with this 220V unit. The Relief Pak® Heating Unit 24-Pack Capacity effectively heats moist heat packs up to 77°C in an insulated hot water bath. Insulated design keeps heat from dispersing out of the unit, allowing it to retain heat. It is made from durable stainless steel that's perfect for high traffic clinics and its mobile design with rolling feet allow it to be easily moved across a room. This heating unit features adjustable temperature control and a glowing orange light illuminates when the unit has reached its desired temperature. It is best to use moist heat packs at 71°C for best results. An on/off switch glows green when the unit is in use. 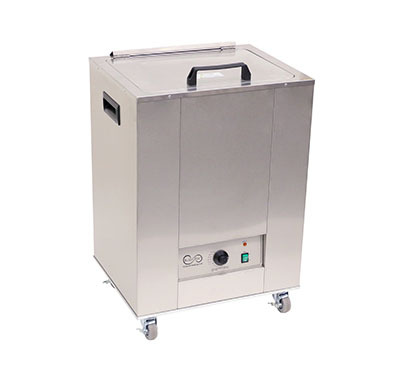 This unit has a 24-pack capacity that can heat up to 24 moist heat packs. A removable plug set comes with this 220V unit.